Shirley A. Ahrendsen, 77, of Hale passed away peacefully with her family at her side, Monday, May 2, 2011, at St. Luke's Hospital in Cedar Rapids, Iowa. A celebration of her life service was held on Friday, May 6, 2011 at 11:00 a.m. at Lahey Funeral Home in Olin, where friends called from 10:00 a.m. Private burial was held at the Wyoming Cemetery. Shirley Alice Holmes was born October 3, 1933 in Monticello, Iowa, to William H. and Erhmal (Farnham) Holmes. She married Harold Ahrendsen on March 16, 1968 in Monticello, Iowa. Shirley worked at Collins Radio on the assembly line for twenty-seven years, retiring in 1988. 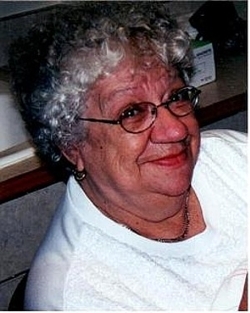 She was a member of St. John Lutheran Church, Olin, and the Olin Legion Auxiliary. She liked to play cards and go to bingo. Shirley is survived by her husband, Harold; four children, Denise (Mick) Sidway of Monticello, Tim (Cindy) Holmes of Olin, Bryon (Deb) Ahrendsen of Anamosa, and Eric (Heidi) Ahrendsen of Marion; six grandchildren, two great-grandchildren; three sisters, Mary Callene Jeffreys of Monticello, Judy (Bud) Simmons of Amber, and Linda (Mike Edwards) Varner of Monticello; two brothers, Jim Holmes and Donald (Connie Shover) Holmes, both of Monticello. She was preceded in death by her parents, one sister and four brothers.